Hovers about and occasionally swirls in the air. Unlike the Enchanted Cauldron and Enchanted Torch, the recipe for this pet can only be obtained by completing a short quest chain given by Enchanter Nalthanis in Dalaran (Broken Isles). The quest begins with, An Enchanting Home (requires player level 106) and leads to the final quest which has players travel to Halls of Valor, a 5-man dungeon. Upon completing the last quest, the player will automatically learn the recipe for the Enchanted Pen. Fade into a cloud of mist, increasing your chance to dodge by 100%. This pet made short work of No-No. Quills first turn, evanescence to dodge dive, apply forboding curse, quills again until he dives, evanescence, forboding curse, kill him with quills. The timers were perfect. Quills buffed by forboding curse, combined with magic type resistance to aquatics and a dodge, may make Enchanted Pen really shine against quite a few aquatic types. Only one of two battle pets so far that have the Nevermore skill. It's not very effective in PvP battles, especially because of the 20 round cool down. But, in certain PvE battles where the moves are predictable, this can be quite useful and fun. With only 305 speed, Counterspell will almost never process it's useful benefit against a flyer unless you couple it with Forboding Curse. Even then, the flyer will most likely have to be less than half health. I love the look and animation. I rather like what this pet looks, will have to level it soon to get to try it out, but Quills, Evanescence, Foreboding Curse seems like really solid move set with great synergy, as both quills and evanescence benefit from going first and foreboding curse lowers the enemy speed so much that it should go first against anything that isn't a flier. I definitely need this! ... On my Inscription character. I guess I'll need to prioritize leveling my Enchanter a bit earlier than I anticipated so I can make it for her. Considering the potential of enchanted items, this one just had to come into existence… even though it'd be nice if it followed scribes aswell! What a backwards set of pet moves. Feathered Frenzy has nothing except Counterspell to buff with the extra 50% damage. With a 3 round cd too. 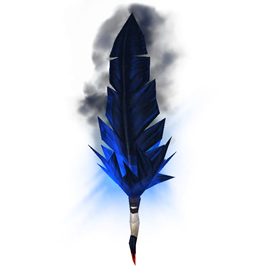 However Forboding curse with Quills looks awesome.